If you’re living with chronic pain, have you considered meeting with a physical therapist? Many people aren’t aware of the numerous benefits associated with physical therapy. The team of orthopedic specialists at Tahoe Fracture & Orthopedic Medical Clinic’s Reno, Nevada, location includes experienced physical and occupational therapists who can work with you to relieve your pain, increase your range of motion, and more. Many people are under the impression that physical therapists only treat patients who’ve recently undergone a surgical procedure, or those who are recovering from a traumatic injury. It’s true that physical therapy plays a large role in the rehabilitation process. But, physical therapists do much more than that. And, if you require the use of a cane, walker, or other assistive device, a physical therapist can teach you how to properly use it. When you meet with a physical therapist for the first time, he or she will sit down with you to discuss your symptoms and get a better understanding of your condition. Your physical therapist will then conduct a series of tests to evaluate your range of motion, flexibility, posture, and more. 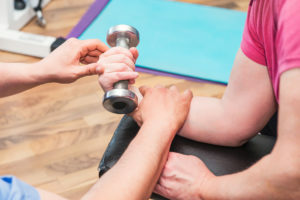 Once he or she develops a plan of treatment, therapy sessions will most likely involve some combination of guided exercises and stretches, manual manipulation, massage, and a variety of other techniques. If you live in the Reno, NV, area and you’d like to learn more about what a physical therapist can do for you, please contact Tahoe Fracture & Orthopedic Medical Clinic today.